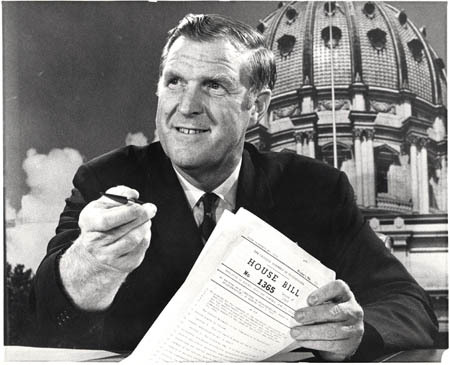 From 1967 to 1971, Ray Shafer served as Governor of Pennsylvania. In his "Final Message to the General Assembly," Shafer outlined his numerous accomplishments as governor, including significant achievements in education, transportation, environmental conservation, human relations, fair housing, and long-term budget planning. In most cases, Shafer continued to enact and promote the policies he had been supporting from the beginning of his time in Harrisburg. As required of the office, Ray Shafer traveled widely throughout the state, where he was the recipient of awards, keys to the city, and other gifts that are now part of the Shafer Collection. Shafer also headed trade missions and fact-finding delegations out of state; over the years, his public service has taken him to more than fifty nations. 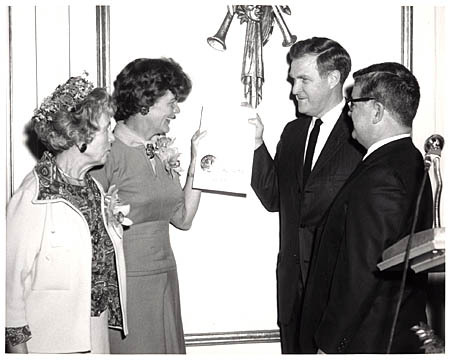 Proclamation of Women in Medicine Week, March 5-11, 1967.Pictured: Mrs. Henry M. Scharf, Gettysburg, Mrs. Paul R. Kaiser, chairman of the board of the Woman's Medical College, Philadelphia, Shafer, Glen R. Leymaster, M.D., president and dean of the Woman's Medical College Shafer with Homer C. Floyd, left, new Executive Director of the Pennsylvania Human Relations commission, and Max Rosenn of Wilkes-Barre, Commission Chairman. February 16, 1970. Under the auspices of Clifford L. Jones Secretary, Department of Labor and Industry, Commonwealth of Pa The key to the U.S. Courthouse and Federal Building in Harrisburg, dedicated on August 7, 1969. 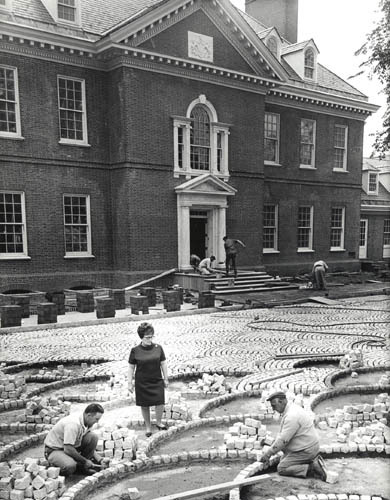 In 1968, the new Governor's Executive Mansion was built under the watchful supervision of First Lady Jane Shafer. Photo Credit: The Sunday Bulletin, Philadelphia. 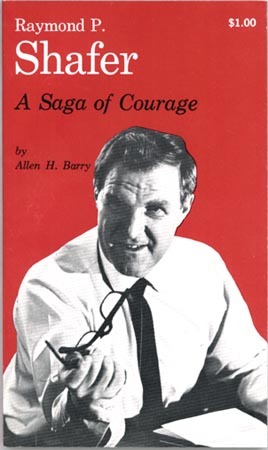 Allen Barry published Raymond P. Shafer. A Saga of Courage in 1968. Two important projects for which the Shafer administration will probably be best remembered were the Constitutional Convention and work on the Interstate Highway system. The Commonwealth of Pennsylvania. Home Page. 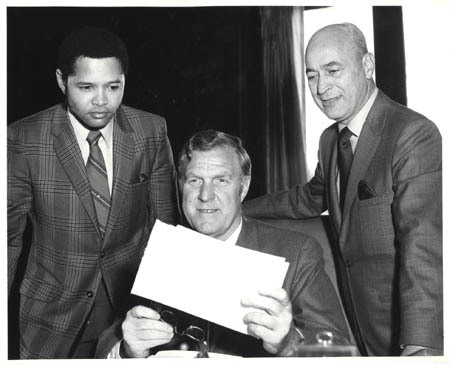 The main site for the PA Department of Labor and Industry includes biographies of Shafer appointees William Joseph Hart (1967-68); John Tabor (1968-69); Clifford Jones (1969-70); and Theodore Robb (1970-71). In 1968, William Scranton Hall and Raymond Shafer Hall residences were added to the campus Edinboro University of Pennsylvania. Governor Shafer was present at the dedication of the new Erie Yacht Club Clubhouse in 1968. Governor Shafer had a role in establishing National Hunting and Fishing Day. In 1971, the Shafer Administration created the Department of Environmental Resources by combining such diverse agencies as the Sanitary Water Board, the Soil Conservation Commission and the Bureau of Mines and Quarries. In a 1995 paper Meeting the Need, former DER Secretaries Goddard, Jones, Duncan and DeBenedictis argue for a restructuring into the two present agencies, the Department of Environmental Protection and the Department of Conservation and Natural Resources. The Pennsylvania Sanitary Water Board's absorption into the DER is reflected in this Final Report. of May 1971.